Not updates... he's referring to "Lifetime License" as Margin STILL states on their order page, even though they've decided to pivot to a Subscription base. How could anyone think this is not deceiving to unsuspecting new licensees? When development ceases on a product, an honest developer should be forthcoming and disclose that they are selling you and EOL product license. My suggestion would be to have a notice or direct link to the press release on the "BUY" page so that people know exactly what they are getting. If i signup for the discount offer,will i loose my remaining free subscription (in my case 6 months) and have to start paying right away ?Just want to make sure. And IMO for those who r complaining,for the love of god,this is crypto trading we are involving in.We loose money from time to time (and am sure it is a lot more than what u paid for Leonardo) with no compensation at all.Leonardo on the other hand gave u a great compensation, if u decided not to support them anymore,just use there free trail to make back what u paid them and just look for an alternative that suits your needs,plus u will get to keep their original app. dbolivar, I wasn't talking about myself in that post. I came here and see how a few loud guys basically lynch everyone (yes looks aggressive) who comes here to share their frustration and I tried to explain why all those users are frustrated. No matter how loud they are, what I see is a massive loss of trust from many users. It is a bad thing for a developer. 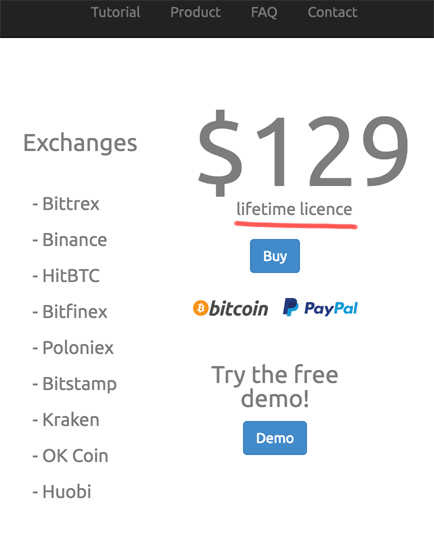 If you mess with one license you're messing with much much more because those who don't trust you won't recommend you (in my case I have a telegram channel with 1K+ crypto traders on it and I won't risk suggesting margin any time soon because who knows what surprise margin will come with tomorrow = I don't trust). Each and every user who was surprised in a bad way won't risk suggesting the tool. My voice was to explain why so many users are frustrated. I genuinely think that sharing your opinion with developer (any opinion, no matter if you nod or not) is in fact helpful for them. And developers should thank ccoldfire for the suggestion to change info on their buy page. Those who share concerns are not a threat for the developer. We're are a representative group, we show a diversity of opinions and feelings and when we share our feedback it helps the developer (if they listen) not to make future mistakes and have better business as a result. If you click buy we advertise that we are re-branding and link to the post explaining all. This has been on our landing page and pricing page since right after we announced. So get your facts right before casting stones. And it still IS A LIFETIME LICENSE. Yes, if you purchase leonArdo now you get to keep it for life and you get 6/12 months of margin for free and after that can decide whether you want to sign up for a subscription with a lifetime 50% discount. No one lied to you. to get at least 1, maybe 2-3 years of supported product. You GET 1 YEAR of margin FOR FREE. Read the post!!!! We also will continue to offer support to leonArdo customers. No one said support was ending. And you get to keep what you bought for LIFE!!!! I just wanted to say that those of you who are supporting us at this difficult time - thanks so much. We are working our asses off to get the next release out which will be the first version margin version. Not sure if we answered you yet. Actually we are still a couple of weeks away from the switch as there is just so much to do to get everything ready. Once we are closer to the release date for margin we will give some notice here. For now, anybody who purchases leonArdo will get the offer all leonArdo customers will get. Well there's my problem, without the clear step by step tutorials, I was unable to have a strategy nor did I make any money. I am in the same boat as you are, in the minus. Yesterday and today I have been reading a great book which has become a classic and is still relevant, Bollinger on Bollinger Bands by John Bollinger. It gives a very good history on the method itself, which was named spontaneously during a live radio interview! I am revamping all the trades I have on Binance which are strictly Bollinger Band trades, made a couple of changes over the week and wasn't satisfied with the results so I decided read and learn from the man himself. The book gives great insight to trading and the history of trading as well as the thought process and mathematics that goes into the methodology. Being new to trading it has enriched my insight greatly. If anyone wants to up their game, I would certainly recommend his book. Congrats on the re branding! I like it, and as an early adopter I will continue to support this team with using the new and improved Margin. Hey Jonathan, thanks for all the work you and your team have put into this project. I, and surely many others, am very grateful for your work. I am a bit confused on the API changes though, from what I can make of your posts your bot wont be tied to your api key anymore but rather to your margin account which holds your api key allowing you to update your key as needed? Again thanks for all the time and effort you guys have put into this. Is this a scam attempt or it is for real? We cannot give trading advice. Legally we are not allowed. We can only provide a tool to trade with. Cryptocurrency value tracker Coindesk places the value of one bitcoin on January 1, 2017, at the price of $997.69. On December 16 of the same year, it reached $19,343, a near-2,000 percent increase in value. It is always a mix between human and bot that works best. So although we provide a super easy to use interface we cannot tell you what parameters to set up a given bot with. For that you need to do your homework. The job we have set ourselves is to build the best crypto currency trading terminal on the market. We think we are already leading in that regard and we will continue to push out lots of new features over the coming months. Thanks a lot for your support! It means a lot to us. It's a scam alright. Thanks for highlighting! Also note that even if you only bought a single license for leonArdo, during the 6 month free period when you can use margin you can add as many exchange connections as you like. Buy on a low trough, sell on a high peak. It sounds easy enough, and can be much farther from the truth. A couple of 'tips' for what I do. Now remember kids, this is what "I" do. It's not official marketing advice, hell I only started with Crypto in December! I don't do anything financial for a living, my wife controls my everyday wallet, not my crypto! 1) Check out coinmarketcap dot com, research the coin you would like to invest in. In particular, the 24 hour volume and change % in the last 24 hours. Honestly, if it's a high change, stay away as you have already missed that wave. Keep an eye on it though, there might be opportunities to jump in when the FOMO / pump&dump subsides. Higher dollar volumes means more people are actively trading that coin, so you should see some action quickly. 2) I use "Margin Maker" 98% of the time. I haven't had a problem with bollenger bot selling at the wrong points, but it just doesn't trade as often as MM in my opinion. I'm all for chasing many small (3-5%) gains in a day. 3) Using LeonArdo. Search for the coin you wish to trade by clicking the 3 horizontal lines in the top left, Add Crypto pair, search. 4) Create a strategy for that pair. Click on the chess piece, slide up or type in the amount of crypto you wish to trade with. Now, NEVER slide to 100%. If this is a test run, start out with just more than minimum or up to 1/5th of your total amount. 5) Adjust your statistics window in which Leo will make decisions. I generally work around 3 hours. 6) Adjust your "Buy margin [% window]" and "Sell margin [% window]". Me, I use about 20 on both. Zoom in on your active candles and look at the peaks and troughs, try and match them. 6) Minimum effective gain. ALWAYS set this. I was losing in the begining because it would sell in a peak below the purchase price. Set it to 3% or whatever you 'think' your profit should be on this crypto. 7) Maximum order age. I'm on Bittrex, so the minimum i can use is 0.10. 8 ) Tick the "Avoid direct buy" and "Avoid direct sell", and put in say "0.300". this will tell leo to try and buy at 0.3% lower than what is currently on offer. 9) Right click your chess piece and "Save all strategies", so it sticks if leo crashes. 10) Hit start and leave Leo do his job. If all goes well, and you have a horizontal wavey market, you should be making 3% gains every trade. Of course, this doesn't sound like much at $3 for every $100 traded. But, if Leo smashes out 10 trades in the 24 hour period, you now have an extra $30. This $30 can be then used to start another crypto trade by going back to step one, and researching. Also, use an app on your phone to track trades. I use "Delta" on my android. you can enter in the exact amounts at buy and sell times, and it will give you an exact amount gained or lost. Seriously man, it's a pretty fun learning curve. If you take the time to play with the demo side, and learn it first, you can't really go wrong. I spent 4 days straight playing with Leo before I purchased. Thanks for sharing your experience DKR!